WordPress is simplest CMS. Small kid can understand and use this CMS, But sometimes we need guideline for better understanding and use. I know ninety-nine percent techies already know WordPress. WordPress is not only good blogging platform, it is very easy to customize as per our need. For customization there are plugins, theme, and widgets. So for you guys who need a reference i have listed out best collection of WordPress books . Hope these books will help you to learn WordPress CMS. Digging into WordPress is a beautiful book, every page of the book is printed with stunning digital-color precision on gloss-finish paper, with each of its 12 chapters color-coded to provide quick and easy navigation. With its large, clear typography, each page is easy on the eyes and easy to read. WordPress In Depth written by Bud Smith and Michael McCallister. This book is aimed at beginners but near the end, provides ample opportunity to explain themes and plugins a little more in-depth providing a stepping stone to not only more advanced topics, but advanced books as well. Teach Yourself WordPress in 10 Minutes gives you straightforward, practical answers when you need fast results. By working through its 10-minute lessons, you’ll learn everything you need to build great blogs with WordPress and WordPress.org. Coverage includes quickly building blogs for free using WordPress.com, managing blogs from the Dashboard, customizing blogs to fit your message, creating more powerful text and media content, attracting visitors via search engine optimization, moderating comments and building communities. Setting up RSS feeds, hosting your own blog with WordPress.org software, earning ad revenue, using analytics to measure blog performance. Integrating with Twitter and social networking sites, delivering content via iPhone and BlackBerry, streamlining publishing with third-partytools, and much more. A Step by Step WordPress Tutorial for Beginners is written by Mati H Fuller, for people who want to create a blog with as little technical mumbo jumbo as possible. 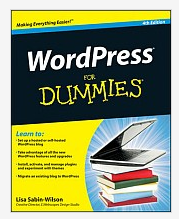 In this book explain What, Why and How to do it in WordPress, in a thorough, step by step tutorial. 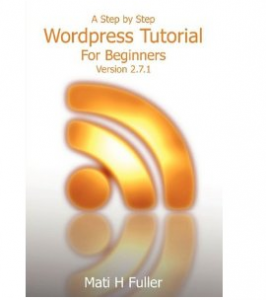 A Step by Step WordPress Tutorial for Beginners is written in simple English, So easy to read. Through this book you learn how to create a self- hosting blog. How to install WordPress with just a few clicks of your mouse. With help of this book you personalize the your blog and change the theme. In your Final result will be a set-up blog site that people will be able to find post after you write your first post. 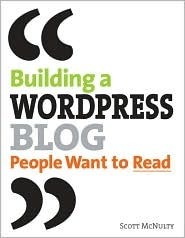 Building a WordPress Blog People Want to Read is written by Scott McNulty. 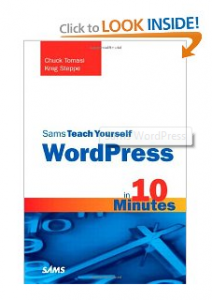 In this book you learn Install WordPress and get your WordPress site running. You can set up your site to ensure it can easily grow with you and your readers. You can manage your site with WordPress Dashboard and extend its capabilities with plugins. You able to work with pages, templates and links and publish your posts. In final you manage your blog site with hepl of this book. WordPress for Business Bloggers will take you beyond the basics of WordPress. This book is witten by Paul Thewlis. You learn from this book is build a custom theme. You examine different type of business blogs. From second chapter of book you learn case study blog and go through the process of developing strategic goals and your blog plan. In third chapter of book is the basics of blog design and work through a brief introduction to HTML and CSS. You will see how easy it is to create your own custom design using the Sandbox theme. In last from this book you learn your basic blog into a more advanced and professional blog as quickly and painlessly as possible. 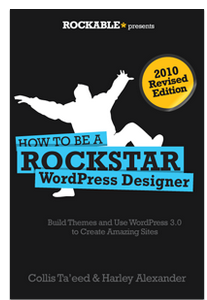 How To Be a Rockstar WordPress Designer covers pretty much everything to do with theming, with three main examples: a blog, a portfolio and a general purpose site. There’s lots of general knowledge, ideas for how to manipulate WordPress in other ways and the book comes with all three themes to use and dissect. This book will teach you how to make theme like a professional themer with a solid understanding of HTML/CSS. You don’t need to know PHP, you don’t need to have ever even touched WordPress before. The examples begin from scratch and build on each other, while basic PHP principles that are used are explained in an easy to understand manner. 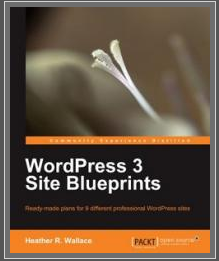 WordPress 3 Site Blueprints is written by Heather R. Wallace. This book isn’t designed for beginners, those with even an intermediate knowledge of WordPress will be able to get these sites up and running in no time. Each chapter is devoted to the design of a different site, there’s no need to read the book in any particular order. Instead, you can pick and choose the blueprints that are of the most interest to you and dive right in. While some experience with WordPress is required to get the most from this book, if you can install themes and plugins, you should be able to follow these easy-to-understand WordPress blueprints. Some knowledge of CSS and HTML will be beneficial, but experience with PHP is not required. This comprehensive book shows you how plugins work, reviews the tools and APIs available in WordPress, and demonstrates how to extend the functionality of WordPress with plugins. In this book authors provides a practical, solutions-based approach along with a collection of timely examples and plenty of code, all aimed at clearly explaining how to create a plugin file, work with users, integrate widgets, add menus and submenus, secure your plugins, and more. You will quickly come to understand how to develop custom plugins so that you can take WordPress to the next corporate and enterprise level. 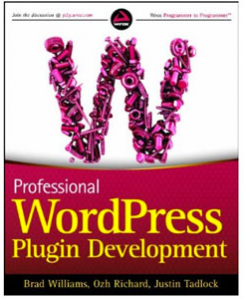 In last with help of this book you can easily develop custom WordPress plugin. WordPress Plugin Development (Beginner’s Guide) is Written by Vladimir Prelovac . This book cover some of the best plugins available on WordPress to generate unique and dynamic content. This book Walk through the development of six complete, feature-rich, real-world plug-ins that are being used by thousands of WP users. Book describe step-by-step instructions with an emphasis on experimentation and tweaking code. WordPress 3 Plugin Development Essentials covers everything you need to know to develop your own plugins for WordPress. How develop your own plugins and release your plugins to the WordPress community. Avoid common mistakes made by most plugin developers by learning more advanced development patterns. Integrate with third-party APIs and web services. To learn this book you customize WordPress Dashboard with menus and administration panels for your plugin. in last with help of this book, you can develop your own plugin and released on WordPress community. WordPress 3 Ultimate Security is written by Olly Connelly. which aims to help you make sure your WordPress installs are as protected as you can make them. Security is often one of the most intimidating pieces of running your own site. This book help to aims to help you harden your WordPress installs, resulting in a more stable, longer lasting website powered by WordPress. Now-a-day many more online books are available. child to the fascinating world of stories and fairy tales .Here is different collection of children’s stories books including popular legends, myths, fables and fairy tales. Introduce your children to the world-famous Indian festival and book like the Ramayana and the Mahabharata. The Moon faced Ganesha’s wrath for laughing at him, when the elephant-headed god fell off the mouse he rode. 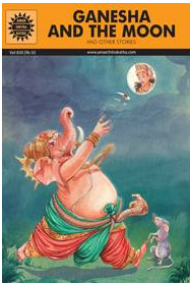 When Ravana obtained the Atmalinga from Shiva, the gods were perturbed and turned to Ganesha for a solution.Kind-hearted, benign and always ready to help, Ganesha can also display anger at injustice and foolishness.This Amar Chitra Katha features stories that revolve around one of the most popular and endearing figures in Indian mythology. The Goddess Gauri while bathing, created Ganesha as a pure white being out of the mud of Her Body and placed Him at the entrance of the house. She told Him not to allow anyone to enter while she went inside for a bath. Lord Shiva Himself was returning home quite thirsty and was stopped by Ganesha at the gate. Shiva became angry and cut off Ganesha’s head as He thought Ganesha was an outsider. When Gauri came to know of this she was really mad. To console her grief, Shiva ordered His servants to cut off and bring to Him the head of any creature that might be sleeping with its head facing north. The servants went on their mission and found only an elephant in that position. The sacrifice was thus made and the elephant’s head was brought before Shiva. The Lord then joined the elephant’s head onto the body of Ganesha. of stories. 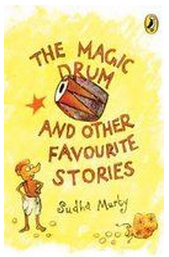 The clever princess will only marry the man who can ask her a question she cannot answer; the orphan boy outwits his greedy uncles with a bag of ash; and an old couple in distress is saved by a magic drum. Sudha Murty’s grandparents told her some of these stories when she was a child; others she heard from her friends from around the world. 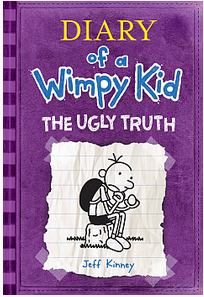 Diary Of A Wimpy Kid: The Ugly Truth written by Jeff Kinney . Summery is like, It has been four weeks since Greg Heffley had a big fight with his ex-best-friend, Rowley Jefferson. Then he finds out that Rowley’s parents found a replacement best friend: a hired role-model from a company called “Cool Brian”. Now struggling without a best friend, Greg’s attempts to become popular in various aspects, most of which are immediately backfired. Another struggle that arises, is that Greg has to attend his uncle’s fourth wedding, and when his wedding comes, Greg will have “The talk” with his great-grandmother Gammie, a polite but sly and clever old woman. c) Indra Finds Happiness written by Dr Devdutt Pattanaik. The summery of An Identity Card For Krishna is One day, when Krishna wanted to board an aeroplane, he was not allowed to! All because he did not have an identity card. Then his friends Garuda and Sesha took him to meet Lata-kumari in Guwahati, who told him the story of Anasuya and the Ashwini twins, and why Rishi Chavan made a rule that all gods should carry a dhvaja—a flag with each god’s very own symbol. The summery of Gauri And The Talking Cow is Little girl Gauri thinks milk comes from packets, till she meets Sweety the talking cow. Sweety tells Gauri about the first cow on earth, Surabhi, and how she provided so many useful things to man—fuel, manure, medicine and shelter. Sweety narrates stories about a king who found good luck because he gifted cows to many people, and how another king was turned into a lizard because he was not careful about who he gave his cows to! Sweety also tells Gauri how Krishna the cowherd looked after his beloved animals, and why Kali decided to comb her hair. And the summery of Indra Finds Happiness is Little Harsha was sad, so a cloud flew him up to Indra’s palace, just to show Harsha that the king of gods was sadder than him! 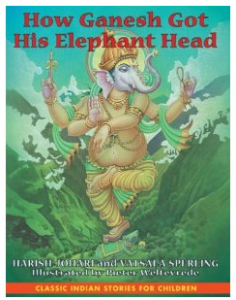 There, with his new friends Indra and Airavata, the six-tusked white elephant, Harsha sees so many amazing things—a wish- fulfilling tree, a pot of never- ending gold, and a potion that keeps him healthy. Then Indra thinks of a naughty plan—to steal Vasishta’s cow! When he catches Indra, a very angry Vasishta tells him the secret to being happy. Akbar And Birbal written by Amita Sarin. Every one know the friendship between Emperor Akbar and his minister Birbal created history and some delightful stories. This book brings together a selection of stories, along with fascinating historical details about the Mughal court, the emperor and his witty courtier. From the time that a chance meeting in the forest brought Akbar and Birbal face-to-face, the emperor and his minister together faced dilemmas that ranged from the ethical to the personal, from debates on the true nature of justice to the problems of hen-pecked husbands. An old widow is robbed of her bag of gold and Birbal nails the culprit. A thief runs away with the emperor’s royal seal but gives Akbar a surprise later. Birbal manages a miraculous escape when envious courtiers conspire to have him killed. The king asks his ministers how many crows there are in the city, and only Birbal has the answer. With well-researched introductions to each aspect of Mughal life, Amita Sarin recreates Akbar’s court in all its grandeur and vitality. The stories in this collection are both amusing and thought-provoking, both historical and timeless. Malgudi Days is among Narayan’s collection of short stories. 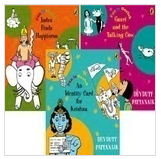 The stories written with Narayan’s simple style and characteristic gentle irony portray the variety and colour of Indian life. Narayan, in his introduction says: “I have named this volume Malgudi Days in order to give it a plausibly geographical status. I am often asked, ‘Where is Malgudi?’ All I can say is that it is imaginary and not to be found on any map…If I explain that Malgudi is a small town in South India I shall only be expressing a half-truth, for the characteristics of Malgudi seem to me universal”. 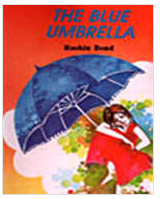 The blue Umbrella written by Ruskin Bond. Summery of this story is As soon as Binya saw the beautiful blue silk umbrella, she wanted it. She wanted it so badly that she was willing to give her lucky leopard’s claw pendant in exchange. No-one in the village had such a fine umbrella, and everywhere Binya went the umbrella went too. Gradually it faded to a pale blue, and was patched in several places, but there was still many who envied Binya her treasured possession. And the most envious of them all was old Ram Bharosa, the shopkeeper, who decided that by some means he must own the blue umbrella. Pinocchio written by Carlo Collodi. Pinocchio is a collection of a series of classical fairytales for children to read and enjoy. It lets children join the fantasy characters in their adventurous and enjoy the enchanting world of fairy tales. 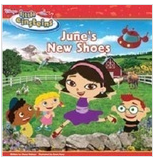 June’s New Shoes written by Disney Enterprises. Summery of June’s New Shoes is Little Einsteins takes pre-schoolers on thrilling learning trips around the globe, with a cast of four enthusiastic adventurers and a transforming rocket! From the Amazonian Rainforest to the Great Pyramids to under the sea and into outer space, Leo, Quincy, Annie and June invite preschoolers to join them as they work to complete important missions in exciting locations. With stunning real-life images, famous works of art and classical music as storytelling devices, children discover the arts while work ing as a team to explore, problem solve and complete the mission of the day. And if children are engaged, you can bet their parents are too! After all, who wouldn’t want to spend a half hour zooming around the globe with Rocket, solving fun and interactive missions? And when the mission is accomplished, everyone joins in the celebration. Magic Tree House: Dinosaurs Before Dark written by Mary Pope Osborne. Summery of Dinosaurs Before Dark is Jack and Annie are ready for their next fantasy adventure in the bestselling middle-grade series—the Magic Tree House! Where did the tree house come from? Before Jack and Annie can find out, the mysterious the mysterious tree house whisks them to the prehistoric past. Now they have to figure out how to get home.Can they do it before dark or will they become a dinosaur’s dinner? Elephant Dance written by Theresa Heine and Sheila Moxley. 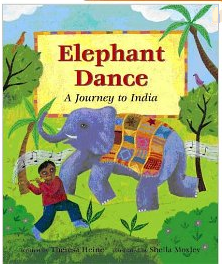 The story of Elephant Dance is Ravi listens to the captivating stories his grandfather tells about India, where the sun is like a ferocious tiger and monsoon rains cascade like waterfalls. Notes after the story include facts about India’s animals, food, culture and religion, and a simple elephant dance music score. 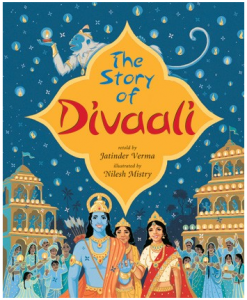 Discover the powerful and captivating story of how Divaali, the Indian festival of lights, was born. This rendition of the age-old Indian epic The Ramayana is brimming with action and adventure, drama and triumph. The Tiger Child: A Folk Tale from India written by Joanna Troughton. In this book ‘ The Tiger Child’ explains why tigers eat their food uncooked and why cats live with people. The tiger child is sent to fetch some more fire from the village, but on the way he gets distracted by his friends. By the time he gets to the village, he has forgotten what he has been sent to fetch. The Grandmother’s Tale And Selected Stories written by R. K Narayan. The summery of this book is Bala, the central character, was married at the early age of seven to Viswa a boy of ten. One day, he just left bidding her good-bye, joining a group of pilgrims going to Pandaripur. Years go by and there is no trace of him. Bala, now a young woman finds life extremely difficult with the entire agraharam gossipping about her husband’s fate. She leaves home, determined to find him. The arduous journey she undertakes to Poona, her success in locating Viswa and persuading him to return to the South and their long, happy life in Kumbakonam, where five children are born to them, Bala’s death and eventually Viswa’s death due to poisoning by his cook form rest of the narrative. The delineation of Bala from an innocent school-girl to a firm, determined, aggressive young woman and finally to a quite, docile, orthodox Hindu wife is fascinating!